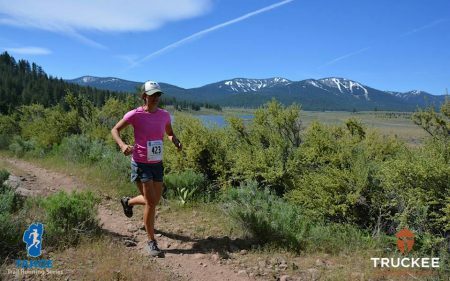 The Waddle Rach Half Marathon took place on June 4th, 2017 and is part of the Truckee Running Festival and the Tahoe Trail Running Series put on by Big Blue Adventure. If you’re a local Truckee runner, you have likely “explo-run-ed” Waddle Ranch. If you haven’t, you should as it’s one of the many local trail running/hiking treasures that the area has to offer. The half marathon starts and finishes at Riverview Sports Park in a mini “race village” amongst very high-energy event staff, volunteers, announcer (can I please have whatever coffee he drinks in the morning) and participants. 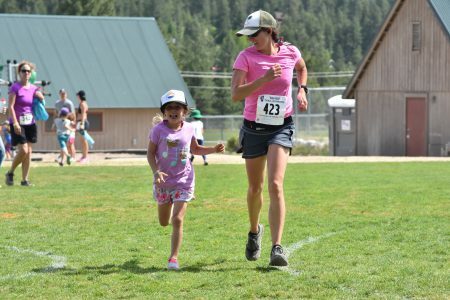 Besides the fact that there are 5K and 10K options for family and friends to run, the Park is a great place for spectators and family to hang out as there’s plenty to keep them busy along the lines of a playground, bocce court, the Truckee Bike Park, etc. Once the Big Blue crew gives the pre-race speech, and the very enthusiastic GO signal is given, you’re off. The first 1.6 miles of the course is very flat (not Tahoe flat) and is comprised of getting out of the park itself, running a short distance on pavement (Joeger Drive) and then on fire road. Here you pass behind the Tahoe Truckee Unified School District Bus Dispatch Center. If you’ve ever been late to pick up your kid from the bus, you’ve likely been here to collect him/her (not that I would know anything about that). Anywhooooooo…… It’s a pretty meadow with scenic views to the east. At 1.6 miles you begin a short climb on pavement which takes you up to Martis Creek Road. The climb itself is only about a quarter of a mile, but you then stay on pavement for about a mile. I know pavement – ew, but the views of Martis Valley, Martis Creek Lake and Waddle Ranch (where you’ll be running) are very pretty, so consider it an opportunity to look around before you have to pay attention to not tripping on rocks. After you cross the dam (at about 2.2 miles into the race), you finally hit dirt via Matt’s Trail in the Waddle Rach Preserve. It’s relatively flat for about three-quarters of a mile and then you start to climb – for a solid mile. You’ll gain about 450 feet in elevation in this mile. It doesn’t sound like a lot, but it will put your legs and your lungs to the test. The trail here is mostly single track with some wider sections that look like they used to be fire roads. Run as much as you can – it’s only a mile. You peak out where Matt’s Trail intersects with Sawmill Road (don’t let the term fool you – it’s a fire road) and then you descend. The descent is fast since Sawmill Road is fairly “groomed” and doesn’t have a lot of wear and tear from runoff or loose rock. After about 1.2 miles, you divert off of Sawmill Road and back onto single track for a bit more technical running. This section lasts for just about a mile and then you re-connect with Sawmill Road and run just under a half-mile to the turnaround. Now begins your second ascent. The whole half marathon course has about 1,200 feet in total elevation gain, so that 450 feet you descended down before, you now have to climb back up. This section spreads the climb out over two miles so while it’s a bit gentler than your first climb, it seems like it lasts FOREVER. At 7.9 miles into the course you veer off of Sawmill Road and back onto single track via Erika’s Trail. You climb for about a half mile here and then begin a pretty technical (read rocky) decent. I constantly have to remind myself here to watch my ankles, stay on my toes and don’t let the feet get sloppy. That steep, technical descent lasts for about 3/4 of a mile and then it opens up onto less technical ground. At 9.5 miles the course flattens back out, albeit at a very gradual climb out to the pavement. Once you’re on the pavement, it’s a fast and flat return into the park where family, friends and spectators will be awaiting your arrival along with beer and a BBQ!